Boeing’s 747 jumbo jet is on life support. With less than two dozen orders left on the books, the company is scrambling to find new buyers for the its most famous aeroplane. 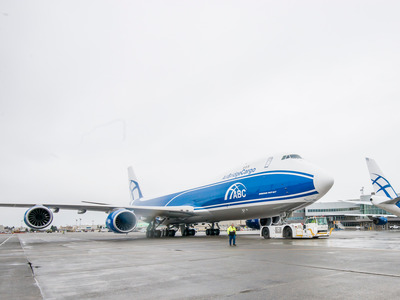 According to Bloomberg’s Julie Johnson, Boeing is close to landing a firm order for 10 747-8 freighters from Russia’s Volga-Dnepr Group and its subsidiary AirBridgeCargo Airlines. At list price, the total value of the order would come to $3.79 billion. Although it is likely Volga-Dnepr negotiated significant discounts. Boeing and Volga-Dnepr could make the announcement as early as next month at the Farnborough Air Show, Bloomberg reported. Last summer, Volga-Dnepr committed to taking on 20 of the planes at the Paris Air Show. However, that agreement was not in the form of a firm order, but rather a less binding memorandum of understanding. Last November, Volga-Dnepr made good on its agreement and took delivery of two 747-8 freighters after another customer dropped out. This latest order would account for 10 of the remaining aircraft from last summer’s agreement. For more than 40 years, Boeing’s iconic 747 jumbo jet has been the “Queen of the skies”. However, with demand for four-engined airliners virtually non-existent, Boeing has struggled mightily over the past few years just to keep the program alive. Earlier this year, Boeing announced that it will cut the 747’s production rate down from 1.3 planes per month down to just one plane a month — in order to buy the program more time to secure orders. These days, the company has to depend on the aircraft’s marketability as a large cargo freighter to find new customers. Volga-Dnepr Group is one of the world’s leading heavy freight carriers. The company’s sizable flagship operation includes a dozen Soviet-era Antonov AN124 ultra-heavy lift freighters. In fact, the Russian airline is who Boeing turns to when it needs to transport oversized loads. However, it will be Volga’s more conventional subsidiary that will take on the new 747s. AirBridgeCargo Airlines currently operates eight Boeing 747-8Fs along with nine older 747-400 freighters.